Today is Muffin Tin Monday, and the theme is cups and liners. I have an assortment of really cute animal liners sent to me from A Pocket Full of Buttons - she has a very fun blog with awesome bento ideas. Pierce had tangerine slices, baby corn, broccoli, homemade black beans, and in the middle a triple decker sandwich of turkey, mustard, and pickle chips. Turns out he really loves these little sandwiches, so I'm going to start making them more often for lunch. This day he ate everything but a couple of bites of black beans. I love your liners and your picks. I would love to get this for lunch. that is a great idea for the kiddos...how cute! i love how you keep everything colorful. what a nice healthy meal too. so many just throw fried crap at their kids without a thought. how festive looking!!! love the little elephant! Very cute. I love the picks. Uh, can I come over for lunch next Monday?? 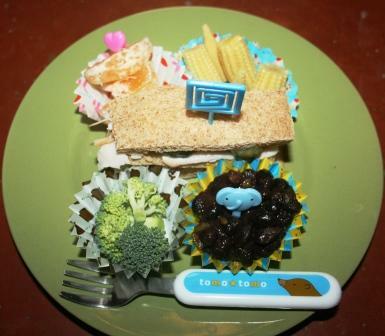 You always have such fun lunch ideas for your kids! I'm guilty of just popping a few chicken nuggets in the microwave and slopping a huge dose of ketchup on their plates...with a side of fruit, of course that they never touch. A great lunch. very colorful. I'm always looking for ways to add fun to our mealtimes! Such a healthy meal! i love it! A colorful lunch. I love those black beans. I usually mash mine. I will have to try them simply cooked and see if the kiddos like them. Happy Monday! It looks great! I love those picks! This is such a cute lunch. I love all the colors of it.